Down District Council launched its brochure ‘Down to Business for the Public Sector,’ which sets out the benefits of locating public sector jobs in Down District. The brochure, launched at the Parliament Building at Stormont by Down District Council Chairman Councillor Maria McCarthy and the Council’s Public Sector Jobs Task Force, highlights the benefits and attractiveness of the District to Government Departments and Agencies locating in the area. Down District politcal representatives, Down District Council officials and local business people at the launch of the jobs brochure at Stormont. In 2012 Down District Council set up a Public Sector Task Force to examine the impact public sector employment was having on the social and economic wellbeing of the District. The Task Force presently chaired by Councillor Liam Johnston includes representatives of Council, the private sector, trade unions and other interested individuals. The Task Force has also received considerable support from local MP’s and MLA’s. A copy of the brochure will be sent to all Ministers, Permanent Secretaries of Departments as well as Chief Executives of major public sector agencies in Northern Ireland encouraging them to consider Down District in future staffing opportunities. The brochure is one of the initiatives developed by the Task Force to attract further public sector jobs to the area. Calling upon the Assembly to revisit the Bain report (a framework for relocating public sector jobs), Councillor McCarthy added: “Under the Good Friday Agreement we are encouraged to look North-South and East-West to share good practice and learn from one another. “It is ironic that Northern Ireland is the only jurisdiction which does not have a defined policy on relocation of public sector jobs. A regional balanced economy is a long-term goal and we need investment to take place across the north. This will improve performances and affordability in the long-term. “Many civil servants from regional towns of Ballynahinch, Saintfield and Downpatrick are forced to commute long distances each day because the job opportunities are simply not available to them outside Belfast. There needs to be fair and equal development from central Government throughout the north. “Our District has a well-educated workforce and an ethos of public service built up over many decades. We as a Council will do all we can to facilitate any prospective employers to locate in the District. 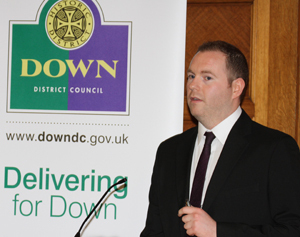 Chris Hazzard MLA (Sinn Féin) hosted the official launch of the Down District Jobs Brochure ‘Down to Business for the Public Sector’ at Parliament Buildings, Stormont. 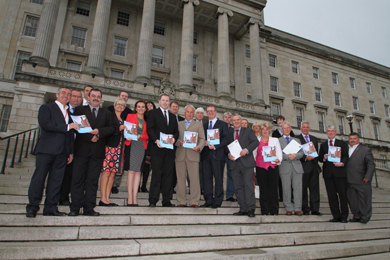 Chris Hazzard MLA was joined by other MLa’s in welcoming the jobs brochure for Down District. Following on from his motion at the Assembly regarding the urgent need for more economic development in the Down District area, Mr Hazzard said he was “delighted to have had the opportunity to host colleagues from Down District Council and the local business community at Stormont. Mr Hazzard said: “It was a privilege to have been asked to facilitate the launch of this very important brochure at the Assembly. In the months and years ahead local and central government will be required to work increasingly closer together in the interests of economic prosperity, so I am delighted that we have continued to build a relationship between Down District Council and the Assembly. 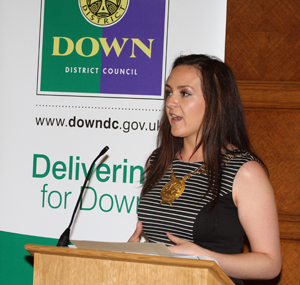 “In Down District we have all the building blocks in place to capitalise on the future decentralisation of public sector jobs, including a highly educated populace and various fantastic facilities such as the new Downshire Civic Centre and public sector Campus. 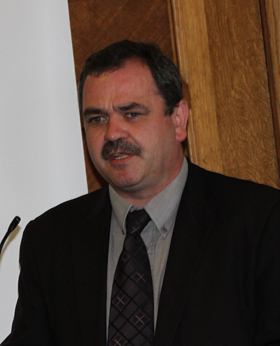 Down District Councillor Liam Johnston, Chairman of the Jobs Task Force, speaking at Stormont. Councillor Liam Johnston also welcomed the publication of the document which emphasises the number of well-educated, skilled and experienced public sector staff living in Down District. Cllr Johnston said: “Many of these workers would welcome public sector jobs closer to home instead of commuting daily to Belfast. The brochure also reminds decision makers in the public sector that Down District has the capacity to expand its public sector employment opportunities well beyond the existing levels. * and monitors future threats to the inward location of public sector jobs and opportunities. “For too long Down District has been a forgotten area. We need to remind decision-makers we are open for business. The three MLA’s Chris Hazzard, John McAllister and Simon Hamilton who sponsored the launch at Stormont also recognised the value of the brochure and offered their continuing support to the campaign to bring additional public sector jobs to Down District. Chris Hazzard emphasised the significance and timing of the document as well as the need to get the message out to those who can influence decisions on location of public sector jobs. He also felt the recently announced jobs boost by DARD offered a momentum for growth. The launch of the brochure is timely coming in the same week as the Assembly debated an adjournment motion on the lack of investment in Down District. The Task Force has undertaken a range of strategies to secure public sector employment opportunities for local people including the preparation and distribution of a public sector jobs brochure. This brochure prepared by the Public Sector Jobs Task Force presents the benefits of locating public sector jobs within the area. In particular it highlights the availability of suitable premises, IT infrastructure, and a high quality, well-educated workforce. The brochure which will be distributed across the public sector In Northern Ireland is a reminder to decision makers of the existing strengths of Down District as a centre for public sector jobs. It also invites public sector bodies to include Down District in their plans when considering options for locating or relocating public sector jobs. 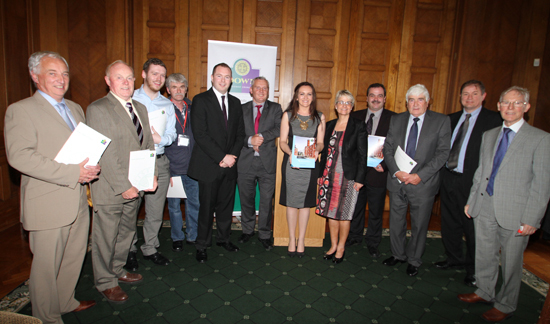 Political representatives pictured at Stormont’s Parliament Buildings at the launch of the jobs creation brochure.